What is the current way to set the cache size to 10 or 20 seconds so that the video over network won't lag? I have an NAS, and use it as a file server. Sometimes when I stream some files through wireless (802.11ac), the video may lag. If I copy the file over to my Mac's hard drive, it takes only about 5 minutes, and the video is more than 1 hour, so it really shouldn't lag, if VLC is smart enough. How can I set VLC to use a larger cache (I see Settings -> Video -> Show All, but don't know if Stream Output: Muxer caching is the correct setting, because setting it to 9000, meaning 9 seconds, the video still would lag). The simpler setting Settings -> Input / Codecs -> Default Cache Level won't work no matter what I set it to). I think the cache can be even smarter if it first cache 1 or 2 seconds, and start playing the video, and meanwhile, just cache "as much as possible", such as 10 or 20 seconds. It will be better not to cache 10 or 20 seconds as a start, because that will mean a long delay to even start up the video. VLC Preferences → Show All → Input / Codecs → Advanced (scroll down) → File caching (ms) and Network caching (ms). File caching is used when using the standard Open File functionality, even if the file is located on the network. 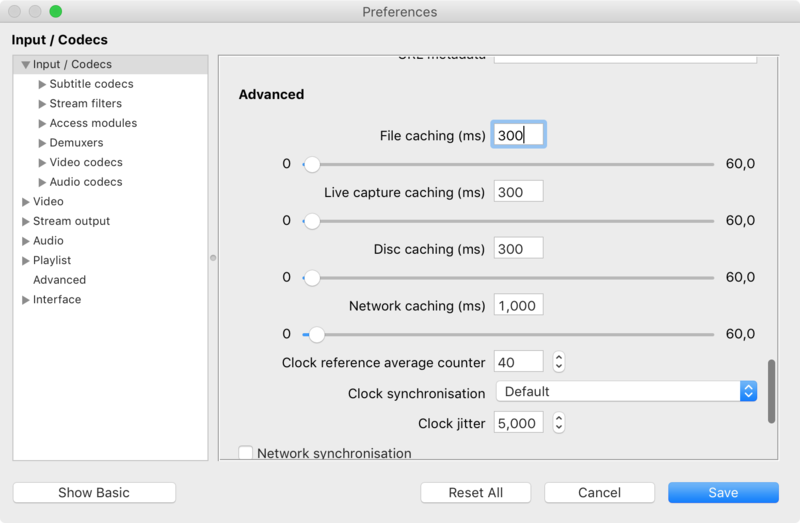 Network caching is for the Open Network function in VLC. Not the answer you're looking for? Browse other questions tagged nas streaming vlc . Is there a way to slightly adjust the subtitles offset in the VLC player? Is there a way to get the VLC app for iOS now? What's the shortcut for Show/Hide Playlist in VLC? How to see the current playback speed in VLC? Is it possible to show the playlist and video for VLC at the same time?